Hawaii hosts some of the most elite and prestigious surfing competitions in the world. The season runs from around October to March every year on Oahu’s North Shore. This when the most skilled surfers congregate on Hawaiian shores to reach new heights and set new records on the waves. Always challenging, and often dangerous, the competitions have carried on for years. And they’ve created a worldwide following of surf enthusiasts. Here are details on such Hawaii surfing competitions. The best Hawaiian big-wave surfing happens in the winter with the greatest competitions kicking off in November. They usually occur on an on-call basis, over the span of a few weeks. Waves and weather patterns are unpredictable. As a result, pro surfers assemble on Oahu North Shore beaches and are ready to compete on a moment’s notice. 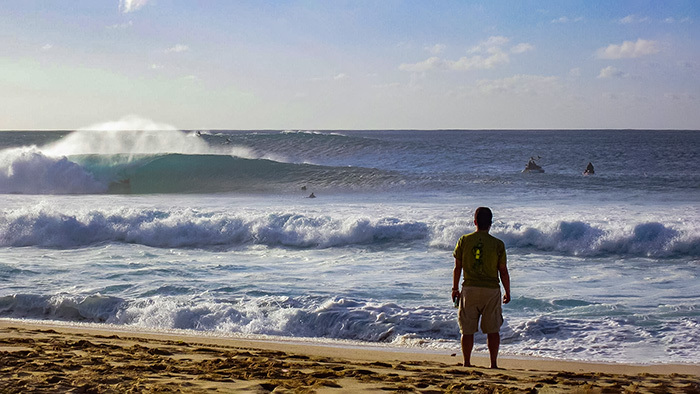 Ali’i Beach Park in Haleiwa annually hosts The ASP Men’s Prime Competition: Reef Hawaii. While legendary Sunset Beach is the site of the ASP Men’s Prime Competition: Van’s World Cup. For those who enjoy watching women surf, you will not want to miss the ASP Women’s World Tour, Maui Women’s Pro. Like many other notable events, this one is held during the November to December time frame. Bethany Hamilton had a notable win in Hawaii in 2014. Kauai-born Hamilton lost most of her left arm in shark attack in 2003. Making one of the most impressive surfing comebacks, Hamilton went on to win a National Title in 2004. And a decade later, she took 1st Place at the Surf & Sea Women’s Pipeline Pro in March 2014. She continues to be an inspiration of courage to women surfers all over the world. One particular event that stands out is the Quicksilver Competition: In Memory of Eddie Aikau. Organizers established the event to honor Hawaiian surfing hero Eddie Aikau. He was a surfing legend who dedicated himself to his fellow men and to the sport of surfing. Big-wave surfing was his way of life. Fearless Eddie would routinely go out into the big waves to retrieve a lost surfer when no one else would go. Tragically, Eddie lost his life in 1978 while swimming out to find help after the sailing canoe Hokulea capsized. He was only 31 years old. His tremendous courage lives on, inspiring other surfers to push the limits and honor this Hawaiian sport. There are strict rules and regulations that make this one of the most competitive and coveted events. The waves must reach 40 feet to hold the competition. But if they are too big, then the decision will be made to hold off for another day. Because of this, the competition has run only 8 times in the last 30 or so years. Lastly, one of the greatest surf competitions you can witness takes place in December. This is when the ASP Men’s World Tour assembles for the Billabong Pipe Masters at Banzai Pipeline. On Oahu’s most challenging beach, the world’s greatest surfers annually compete for a prize of over $500,000. If you enjoy surfing and plan to visit Hawaii, winter will be the time to go. It is a certainly an experience that would make your Hawaii vacation unforgettable.